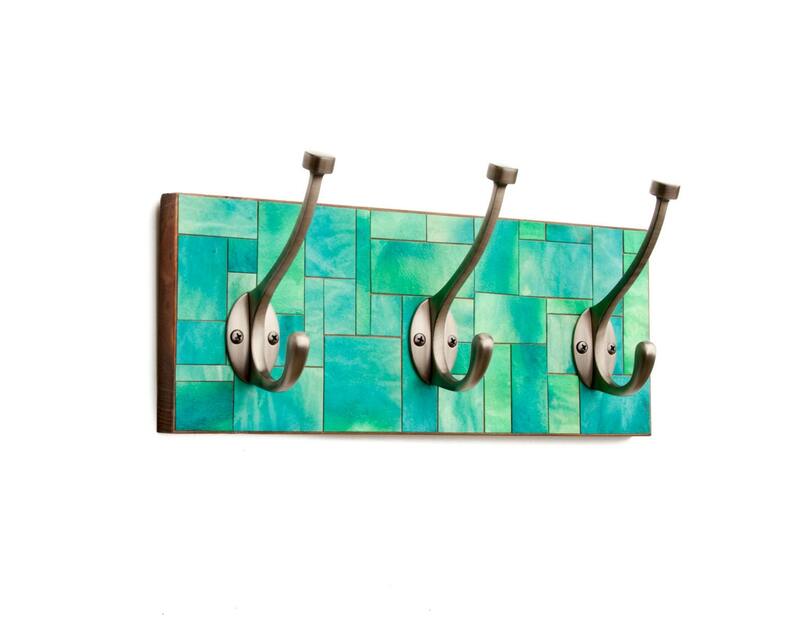 Shades of green, blue and turquoise paper, that I make myself, covers this wood wall coat rack. The contemporary feel is achieved by cutting up the paper and arranging them in such a way that it appears like stained glass. Coat racks are such an easy and simple way to add storage to a room. The hooks are very strong and can hold a lot!! Key hole hangers are attached securely to the back. The hooks, too, can take quite a bit of weight. Wall screws not provided. Coating the paper design are several layers of polyurethane for durability and water resistance. Because of that it is a perfect piece for a bathroom or pool room where humidity is present. We had been searching for 2 years for just the right coat rack, and really loved the look of these -- the vibrant colors and great tone on tone shades. Meg was wonderful to work with -- creative, flexible, and dedicated. We coordinated together to nail the colors we wanted -- even sharing paint samples to overcome the issues of colors reading wrong on an electronic screen. This was so worth it! We love the size, shape, colors, and artistry. Really beautiful and unique dye paper. Will make extra special addition for crafts. Nice assortment of usable scrap. Beautiful color. I accept PayPal as a payment method. Since I want you to love what you have purchased, I do accept returns. Convo me right away if you choose to return something; I can either send you back your money, exchange your item or fix it. Only damaged photos, after I receive them, will be issued a refund. I will allow ten days after the receiving of the item to ship it back to me. Shipment costs are non-refundable. I ship via USPS within three days of receiving payment. I'll let you know through a convo when your item is shipped. Custom orders shipment date will be determined between customer and myself. If you have ideas for a custom order, please send me a convo and we'll discuss the details for creating a truly unique piece for you.